As practical tools for disciplined multi-level modeling have begun to emerge, the problem of supporting simple and efficient transformations to-and-from multi-level model content has started to assume growing importance. 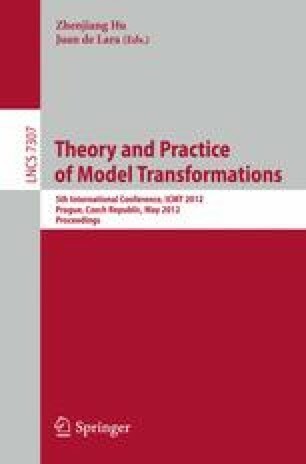 The problem is not only to support efficient transformations between multi-level models, but also between multi-level and traditional two-level model content represented in traditional modeling infrastructures such as the UML and programming languages. This is not only important to facilitate interoperability between multi-level modeling tools and traditional tools, but also to extend the benefits of multi-level modeling to transformations. Multi-level model content can already be accessed by traditional transformation languages such as ATL and QVT, but in a way that is blind to the ontological classification information they contain. In this paper we present an approach for making rule-based transformation languages “multi-level aware” so that the semantics of ontological instantiation can be exploited when writing transformations.